Recombinant fragment, corresponding to a region within amino acids 86-300 of Human BRD9 (UniProt Q9H8M2). 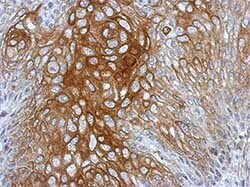 Jurkat whole cell lysate (ab7899); Human Cal27 xenograft tissue. Our Abpromise guarantee covers the use of ab155039 in the following tested applications. WB 1/500 - 1/3000. Predicted molecular weight: 67, 53 kDa. BRD9 is a bromodomain containing protein, which are known to bind to acetylated lysine residues. Immunohistochemical analysis of paraffin-embedded Human Cal27 xenograft labeling BRD9 with ab155039 at 1/500 dilution. ab155039 has not yet been referenced specifically in any publications. Publishing research using ab155039? Please let us know so that we can cite the reference in this datasheet.